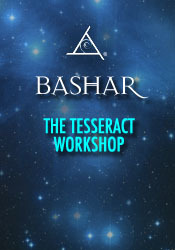 The Tesseract Workshop is a deep dive into sacred geometry. Bashar gives some advanced concepts in math and consciousness, exploring various shapes and how we can use them to access other dimensions. He describes a total of nine polyhedra, six that are physiological and three that are higher-dimensional. This lecture explains the Five Platonic Solids and beyond, in a way that is easy to understand. This is a fun way to explore math for those who may not feel like it’s something they can relate to, and thrilling for those who already enjoy it. A truly unique and empowering transmission.